It seems like every consumer electronics manufacturer is adding more and more Internet-dependent features to every device. Practically every Blu-ray Disc player, HDTV, and smartphone streams internet radio, internet video, and features social networking apps. Navigating between all of the apps can be a challenge. Enter, Google TV. Google TV is an Android operating system for the television powered by a modified Atom processor from Intel. 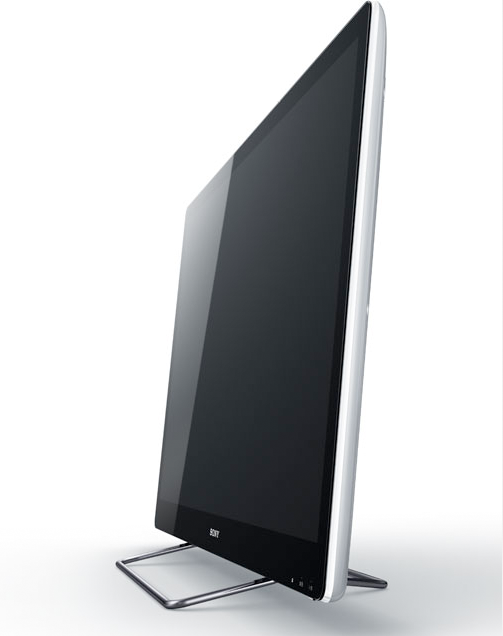 Sony and Logitech have also joined in the endeavor, announcing a Google TV HDTV set and a Google TV set top box, respectively. There are no specs provided for any of the hardware yet. Sony’s offering is called Sony Internet TV, and presumably will include a new line of LCD televisions apart from the current BRAVIA series. Also announced was a line of Blu-ray Disc players integrated into Google TV set top boxes. Logitech does not have any model information available, but they are tentatively calling the variety of options eventually provided the “Google TV companion box.” This will be a stand alone set top box for use with any television, with Logitech Harmony compatibility built in. There is a hint that the companion box will require HDMI, so some TVs may not benefit. There is also a statement in the Logitech FAQs that cable and satellite boxes need an “HDMI output as well,” meaning these receivers may pass through the Google TV box. This makes sense considering the Google TV is supposed to search for television programs. Google TV provides access to websites, and the Sony HDTV and Logitech companion box will support qwerty keyboards. But their main feature is using Google’s powerful indexing abilities to quickly find television programs, online videos, online audio streams, and even access recorded content on compatible cable and satellite DVRs. Internet video from Netflix, Amazon Video on Demand and Youtube will all be supported, with many more to follow. Google is working with multiple cable and satellite providers, but Dish Network will be compatible at launch in the fall of this year. Because this is an Android produce, apps will be supported, though the extent of which hasn’t been detailed yet. Logitech claims they will have “video calling and a variety of controllers â€“ even a Logitech smart-phone app.” The press release does mention Google TV will support Adobe Flash content. Below you will find an introductory video from Google, and the press release. SAN FRANCISCO, Calif. (May 20, 2010) â€” Today at the Google I/O developer conference in San Francisco, leading industry players announced the development of Google TVâ€”an open platform that adds the power of the web to the television viewing experience, ushering in a new category of devices for the living room. Intel, Sony, and Logitech, together with Best Buy, DISH Network and Adobe, joined Google (NASDAQ: GOOG) on stage to announce their support for Google TV. Google TV is based on the Android platform and runs the Google Chrome web browser. Users can access all of their usual TV channels as well as a world of Internet and cloud-based information and applications, including rich AdobeÂ® Flash based content â€“ all from the comfort of their own living room and with the same simplicity as browsing the web. When coupled with the IntelÂ® Atomâ„¢ processor CE4100, Intelâ€™s latest system-on-a-chip designed specifically for consumer electronics, the new platform will offer home theatre quality A/V performance. Sony and Logitech said they would be delivering products based on the new Intel Atom processor and running Google TV later this year. While Google TV is designed to work with any TV operator, at launch the user experience will be fully optimized when paired with DISH Network. Sony announced plans to introduce â€œSony Internet TV,â€ the Worldâ€™s first TV lineup incorporating the Google TV platform. The first models are planned to be introduced in the U.S. market in the Fall of 2010 with the lineup featuring both a standalone TV model and set top box-type unit incorporating a Blu-ray Disc drive. Logitech will introduce a companion box that brings Google TV to existing HDTV home entertainment systems, easily integrating with any brand of HDTV and set-top box. The companion box will incorporate Logitechâ€™s HarmonyÂ® remote control technology, and will include a controller that combines keyboard and remote control capabilities. The company also has plans to introduce an HDTV camera and video chat for Google TV, along with additional choices for navigation and control, including apps to turn a smart phone into an advanced controller for Google TV and home-entertainment systems. Founded in 1998 by Stanford Ph.D. students Larry Page and Sergey Brin, Google’s innovative search technologies connect millions of people around the world with information every day. Googleâ€™s targeted advertising program provides businesses of all sizes with measurable results, while enhancing the overall web experience for users. Google is headquartered in Silicon Valley with offices throughout the Americas, Europe and Asia. Intel (NASDAQ: INTC) is a world leader in computing innovation. The company designs and builds the essential technologies that serve as the foundation for the worldâ€™s computing devices. Additional information about Intel is available at www.intel.com/pressroom and blogs.intel.com. Logitech is a world leader in products that connect people to the digital experiences they care about. Spanning multiple computing, communication and entertainment platforms, Logitechâ€™s combined hardware and software enable or enhance digital navigation, music and video entertainment, gaming, social networking, audio and video communication over the Internet, video security and home-entertainment control. Founded in 1981, Logitech International is a Swiss public company listed on the SIX Swiss Exchange (LOGN) and on the Nasdaq Global Select Market (LOGI). I’m really excited for this! My #1 most wanted product for 2010 was the Boxee box, but now it might be the Logitech Google TV companion box! Absolutely. I may have to switch to Dish Network just for this. Hi Joe here and as a DISH Network employee, I actually played with the Google TV. I must admit, the features surpassed all of my expectations. It is very simple to set up and it combines the ability to watch TV with DISH and browse the internet. This is something I love to be able to do watch TV and surf the net.